Reuters said the virus was first detected in China last month and has been found in 18 farms with many cases more than 600 miles apart, the FAO said in a statement. 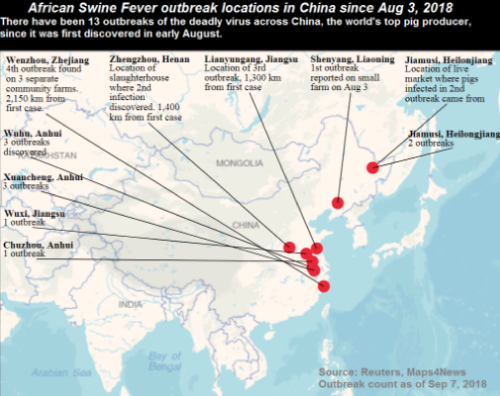 With an abundance of pork farms across China, the FAO indicated the spread of the virus to neighboring countries is almost inevitable. "The geographical spread, of which African Swine Fever has been repeated in such a short period of time, means that transboundary emergence of the virus, likely through movements of products containing infected pork, will almost certainly occur," said Juan Lubroth, chief veterinary officer at FAO. The response to the disease is "extremely challenging" because the virus can survive for months in meat products and animal feed, said the FAO. Since August 03, there have been more than a dozen outbreaks of the virus across the country. This forced the government to enact new transport restrictions of live hogs in provinces where infections have been reported. The epidemic is now taking an economic toll on the annual $1 trillion industry. Pork spot prices in the country’s southern region have jumped ahead of a week-long holiday in October and highlight the need for increased imports. The FAO said officials in China, which produces about half the world’s pigs annually, had slaughtered as many as 40,000 swine in an attempt to control the disease. 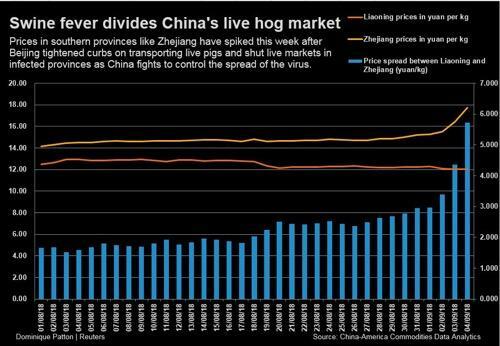 Slaughtering pigs and transportation limits of animals around China have pushed spot prices up more than 5% since August, according to government figures, adding to inflationary pressures as a trade war with the US also drives up soft agricultural prices. In a separate statement late last month, the FAO said the rapid "diverse geographical spread" of the virus in China had induced fears that the disease could move to other Asian countries. 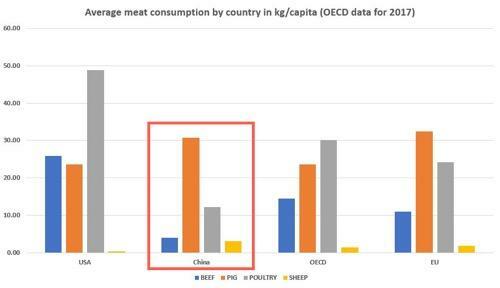 Dirk Pfeiffer, an animal health expert at the City University of Hong Kong, said a "much larger" number of pigs will probably have to be slaughtered in China over the next few weeks, further affecting pork prices. "We need to closely monitor the situation on the mainland, and in particular any imports of live pigs and pork products. We need to aim to get assurance that any live pigs are from areas demonstrated to be free from infection," he added. Experts are perplexed by how the disease, which was previously in the European Union, reached China. Theories include globalized markets with exported meats to the Eastern Hemisphere. Meanwhile, American traders are concerned about the price dynamics of the virus spreading across China. US lean hog futures advanced more than 12% since late August. However, they remain in a bear market since China slapped US producers with a retaliatory tariff. 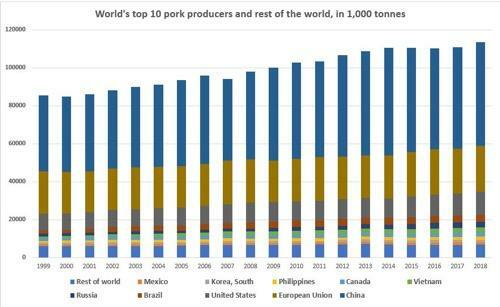 “The African swine fever in China has everybody abuzz… We’re building in a premium for that,” said Don Roose, president of U.S. Commodities in West Des Moines, Iowa. 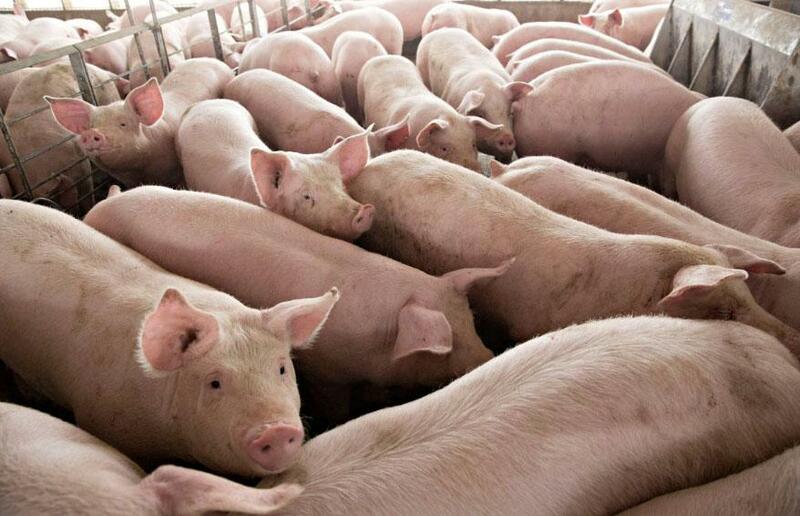 With the virus dangerously sweeping across various provinces in China and officials slaughtering tens of thousands of pigs, at what point will China demand more US pigs despite the tariffs?